I’ve greatly enjoyed the various Marvel Star Wars series, but Star Wars: Yoda’s Secret War left me a little unsatisfied. I’m very happy to say that the next installment–Screaming Citadel–righted the course and returned the series to its high standard. Of course, this volume is not just comprised of the Star Wars series. It also has issues from Doctor Aphra. Obviously, the two comics crossed over with each other to deliver this story as whole. Doctor Aphra has an ancient crystal supposedly housing the sentience of a powerful Jedi. She needs the Queen of the Screaming Citadel to access it for her, and she needs Luke Skywalker to entice the queen into doing so. You’ll have to read the book for the details on using Luke as bait. 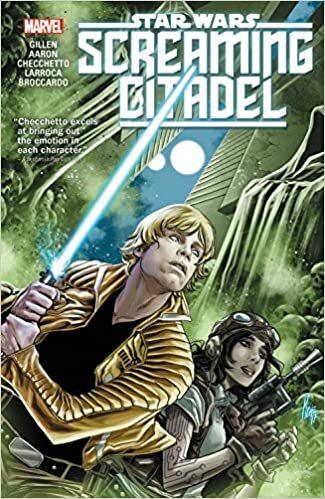 Doctor Aphra sells it to Luke as a chance for him to encounter an actual Jedi master, and it’s a chance for her to witness a remnant of the ancient past because she is an archaeologist after all, albeit a bit of an immoral one. That’s a pretty good premise to achieve what this story is really all about–watching Luke and Aphra interact. I believe Doctor Aphra is one of the greatest additions to the Star Wars universe in decades. She first appeared in the Darth Vader series, and she won over the audience so thoroughly that she quickly earned her own title. Honestly, though Aphra works best when pitted against the pure of heart, or at least those on the side of the Rebels. She’s Aphra, so of course she manipulates Luke, double-crosses him, saves his skin a few times, then cheats him again. That’s just who she is. It’s also interesting to see a rebellious streak in Luke as he jaunts off with Aphra without telling Han, Leia, or anyone else for that matter. We know his dad didn’t always follow protocol, so these little deviations are always revealing when Luke is concerned. It’s also fun to see him beginning to realize his power. This particular story takes place soon after A New Hope, so Luke has not yet begun to completely understand what he has at his disposal–though this book does depict Luke having some pretty cool moments with his burgeoning abilities. We also have quite a bit of Han, Leia, and another invaluable addition to the mythology named Sana Starros. All three get their moment to shine as Han finds more and more of the hero within, Leia further establishes herself as the capable leader she is, and Sana Starros slowly reveals more and more of her past to the reader. Guess what? Not only does she have deep connections to Han Solo, but it’s heavily hinted that she is also tied to Doctor Aphra as well. The specifics may surprise you. And, as always, Aphra’s versions of C3PO and R2D2 steal the show. They are named 0-0-0 and BT-1. They are basically the murderous, demented, evil version of our favorite droids, and they are forever a delight. The story of Screaming Citadel itself is entertaining. The art is very pleasing to the eye and keeps the plot moving at a quick pace. At times the faces of the characters based off of real life actors look almost photo realistic, which is sometimes jarring when the rest of the panel does not look so true to life. Of course, the best quality of the book is simply seeing all of these characters play off of each other. It’s refreshing to have such rounded, charismatic new characters as Aphra, Sana, Triple-Zero, and Bee-Tee 1 making waves with our legendary favorites. This entry was posted in Book Reviews and tagged books, doctor aphra, entertainment, graphic novels, luke skywalker, marvel, read, reviews, star wars.